One of my favorite eats during my Southeast Asia trip was mango coconut sticky rice. The ripe, tender mango, sliced over warm, sweet, salty, coconut-scented rice, topped with crispy mung bean sprinkles for crunch was a perfect snack, dessert or a way to get the nasty taste of durian our of our mouths. I have found a few recipes to try, but in the meantime I wanted a quick fix. I happen to be near Gin U Dee in Stoneham Center this weekend. It is related to Rod Dee in Boston and Cambridge and my web search states that they have excellent mango coconut sticky rice. 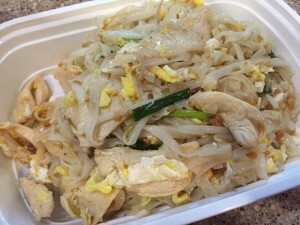 Sadly, it is considered "seasonal," so I had some consolation pad Thai instead. It is a small storefront, mainly takeout, but there is counter seating with 5 low stools. They have some more traditional Thai offerings, but it's hard for me not to get pad Thai, the first time I try a Thai restaurant. I was pleased with my dish. The noodles were not overly sweet, and they were the right texture. The chicken was on the dry side. I got the $10 combo, which included choice of appetizers (I got 2 spring rolls) and a soup (vegetable soup with tofu). The spring rolls were crispy and not oily. Steve's pan fried rice noodle with duck ($8.65) was similar to a chow fun. We both enjoyed our meals. I think we have a new Thai take-out joint. I can't wait till mangoes are back in season.